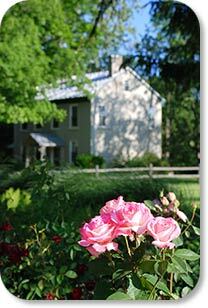 Visit the Richmond Rose Garden's official website at http://richmondrosegarden.com/. The Richmond Rose A.A.R.S. Garden is open 365 days a year, and no admission is charged for visiting the garden. 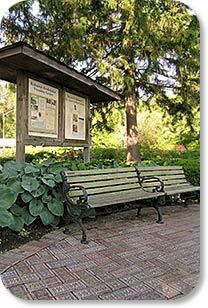 The garden is wheelchair accessible and restrooms are available in Glen Miller Park at the concession building. The Richmond Rose Garden, along with the Richmond-Friendship Garden and E.G. Hill Memorial Rose Garden, is located in Glen Miller Park and faces U.S. 40 East. For directions please see the map below. The peak bloom periods of the garden are in June and September, but gorgeous roses can been seen throughout the summer months. 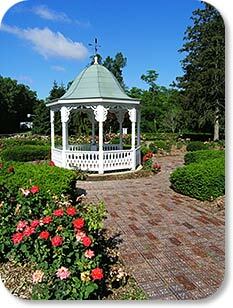 For a fee, the Victorian Gazebo with electrical outlets can be reserved for weddings and special events. Please call (765) 983-7275 for details. Richmond defined itself as the "Rose City" in the early 1970's. The reason for the Rose City designation is that Richmond was the home of Hills Rose Growers. The E.G. Hill Company and the Joseph H. Hill Company together with the Hill Floral Products Company were the premier rose growers and marketers of cut roses, accounting for the sale of millions of roses annually in the U.S. and around the world. The idea of the Rose Garden became a reality in 1985 when the Rose Garden Project Committee was formed with the purpose of establishing a public garden. Many good ideas later, and with generous amounts of community funding in hand, the first roses were planted in June 1987. The walkways of historic star bricks, from older residential areas of Richmond, were donated to the Garden by the city and installed in June 1988. The Richmond-Friendship Garden is the newest addition to the garden project emphasizing our friendship with the German City of Zweibruken. The garden lies between the A.A.R.S. and the E.G. Hill Memorial gardens. It is of German design and features many German roses, a gift from the famed Europas Rosegarten of Zweibrucken. The elegant rose sculpture wrought by The Magaw's of Boston, Indiana symbolizes that friendship. Today visitors experience the beauty of this flourishing twenty year old garden that highlights over 100 varieties of All American Selections® Roses, amidst blooming annuals, perennials, and ornamental trees that add an interesting texture to the garden. The Richmond Rose Garden is maintained almost exclusively by local dedicated volunteers who offer their talents in rose care as well as significant amounts of time tending the garden. Volunteering can involve anything from weeding for two hours, adopting and maintaining one of the beautiful beds, to becoming involved in the volunteer committee that meets once a month to consider and address the needs of the garden. The garden is always in need of willing hands. A PDF copy of our garden Volunteer Guide will offer an idea of the opportunities available to help in the garden, as well as giving some wonderful Rose Care tips. 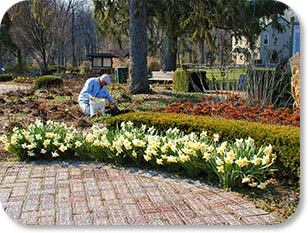 If you are interested in volunteering to work in the garden, please call the Wayne County Foundation at 765.962.1638. If you are interested in attending an open committee meeting you are invited to join us at noon at the Wayne County Foundation building at 33 South 7th Street, Richmond, Indiana on the fourth Tuesday of every month between February and November. As a unique memorial or honorary gift, for a donation of $100, the back of a historic star brick can be inscribed with words of your choosing and added to the Memorial Walkway. The garden also welcomes corporate donations toward specific needs and projects that will both benefit the garden and highlight the businesses involvement in the community. If your business would be interested in this sort of tax-deductible gift there are many needs and opportunities available. 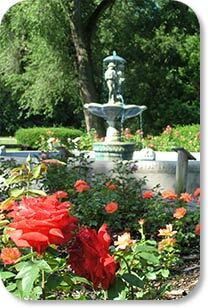 Online Donations: please reference the RICHMOND ROSE GARDEN FUND.